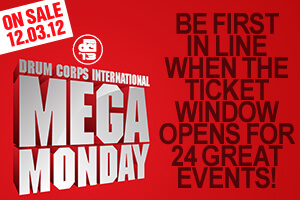 If you'd like to get your hands on tickets to some of Drum Corps International's most popular events from June through August, mark your calendars for MEGA MONDAY coming up on December 3! On that very special day, we'll be putting tickets on sale to a huge number of shows that make up the 2013 Drum Corps International Tour. This will be your early opportunity grab some of the best seats in the house for some of the most popular tour stops of the year. Before then, be sure to sign up for DCI.org's "Box Office Alerts" at DCI.org/fans so you can be in the know when these and other 2013 event tickets will go on sale. The following tickets will be available through the Drum Corps International Box Office or Ticketmaster on MEGA MONDAY, Dec. 3.